A pretty much full house at the Bruce Mason Centre on the lead up to a long weekend has to be a very good sign. 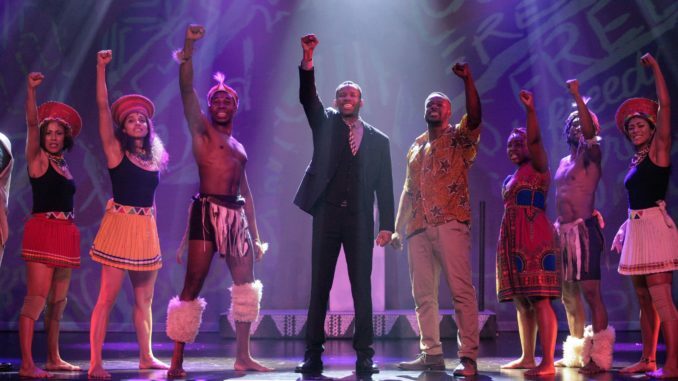 And it is clear that the decision to open MADIBA the Musical, a celebration of Nelson Mandela, in the heart of Auckland’s South African community is undoubtedly an astute move. Many of us have read Mandela’s autobiography, Long Walk to Freedom, so we appreciate how daunting the French creative team’s task must have been to distill such a rich and dramatic life into a single evening. But somehow they manage to do so. A French creative team you ask? Yes, interestingly this is an Anglicised adaptation of the French show, written and composed by Jean-Pierre Hadida and co-authored by Alicia Sebrien, about a multi-lingual nation. Timed to mark 25 years since the abolition of apartheid in South Africa, MADIBA the Musical features African dance and vocal traditions set alongside eternal love songs and stirring anthems. Mandela’s lifework as a lawyer and activist for peace is told through young artist William Xulu’s (Barry Conrad) story, a victim of apartheid in South Africa. Nationalism and nationhood are the redeeming themes here, after decades of invasion, settlement, oppression, division, ignorance, hatred, resentment, murder, love, change, regret, redemption, forgiveness and hope. The show cracks straight into Freedom/Stand & Fight, immediately revealing the soloists’ vocal skill and power in this electric opening number giving us confidence in the production and anticipating a great night. Johan Nus’ choreography is a visual progression through the ages employing measured accented dance styles delineating the Western influence in the pre-apartheid period. And ultimately culminating in more joyous and free expression of African dance styles that represent the post-apartheid era. Hearing Madiba’s (Perci Moeketsi) distinctive and revered voice was initially startling due to its uncanny realism. And his vocal range syncs perfectly with his incrementally changing poise, mana and wisdom as we are literally scampered through the decades of a man’s tribulations and trials who becomes a symbol, a leader and finally a nation’s inspiration. Weaving the puck-like narrator (David Denis) betwixt and between the onstage antics allows the story to surge ahead, peppered with occasional juicy, humorous and poignant comedic injections as events unfold before our very eyes. 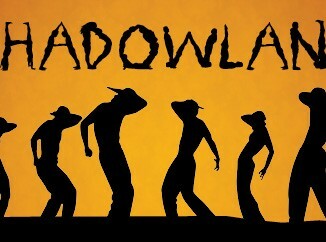 The imaginative animated graphics backdrop cleverly whizzes through over nine decades of his life using a variable style and palette while subtly incorporating key milestones along Madiba’s long walk to freedom. However, the less than slick set changes and transitions let this production down as we are left hanging at times, waiting for the story to move on and highlighting some of the substandard production elements such as the cumbersome mobile platform and the stark lack of effective lighting design. MADIBA The Musical, in language and song, never shies away from the hard truths of apartheid – underlining how both sides are hardened against one another living side by side embracing two unflinching disparate ‘ideological’ systems. The progression of which was cleverly revealed in such numbers as Sharpeville and Freedom is Our Right. The reconciliation of these diametrically opposing sides, when freedom and equality are achieved, are heart-wrenchingly exemplified in the reconciliatory songs, including To Live in Peace and It’s Time to Forgive. The great duet, The World is On Our Side, between William Xulu (Barry Conrad) and Sam Onotou (Tim Omaji) turns into a skillful, albeit humorous, singing ‘competition’ showcasing their talent. This comedic relief comes just at the right time, when the show could so easily have been bogged down by negativity. And it would be remiss to omit the incomparable female vocalists on stage. Highlights are Tarisai Vushe’s (Sandy Xulu) solo renditions of Standoi Saami and Do You Think That This Will Ever Change? and Ruva Ngwenya (Winnie Mandela) belting out Fighting for Our Rights. Overall we feel the female formidable talent is underutilised, which is an absolute shame. Throughout the production it’s obvious that the cast try their best to work with a script that can appear flippant at times. However, it’s their honest performances that ensure that there isn’t a dry eye or a seated audience member in the end, testament that everyone has been moved both emotionally and physically. What more can you ask from an entertaining night out? Definitely worth a look in. MADIBA the Musical plays at the Bruce Mason Centre, Auckland until 3 February and then tours to Wellington and Christchurch.